Choose "unthirsty" plants which need less water to grow. Your local University Extension Service county agent or neighborhood garden shop can tell you which plants are drought-resistant and require very little water. Many island plants and shrubs fall into this category. 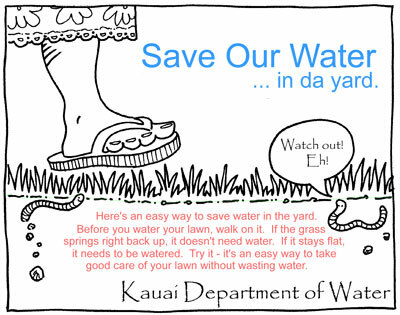 Water your lawn during the early morning or evening hours to minimize evaporation loss. It also achieves greater soil saturation, and provides better plant absorption of the water. Water on calm days to avoid loss of sprinkler water by strong winds. Watering schedules differ depending upon the interior climate of a house plant. In air-conditioned rooms, which are drier, water at two- to three-day intervals. In warmer, damper environments, watering once or twice a week is sufficient for most plants. Avoid overwatering. If runoff occurs, stop watering immediately. Adjust automatic sprinklers and/or select proper nozzles to minimize runoff. Use mulch or grass clippings around plant bases to retain moisture. Deep penetration through soaking is more effective for most of your lawn. Several light sprinklings may be more useful on slopes and hilly areas, in the shade, or where the soil is sandy, rocky, or full of coral. Use the touch test to see if your plant needs watering. Poke your finger into the soil about 1/2-inch down. If the soil feels relatively dry, it's time to water. Place pots in pans a little larger than their bottoms, and fill half of the pans so that plants can draw water from the tray through capillary action.